The Dividist Papers: "The maxim of civil government being reversed in that of religion, where its true form is..."
"The maxim of civil government being reversed in that of religion, where its true form is..."
"... divided we stand, united we fall." The words of Thomas Jefferson in an 1820 letter to Dr. Jacob De La Motta. An image of the letter is above and the full text directly below. "Th. 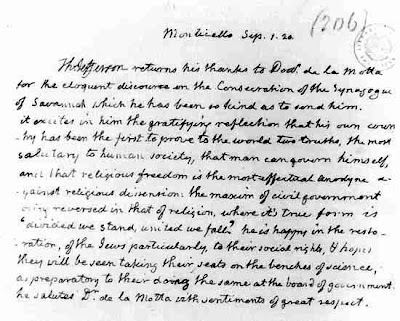 Jefferson returns his thanks to Dr. De La Motta for the eloquent discourse on the Consecration of the Synagogue of Savannah, which he has been so kind as to send him. It excites in him the gratifying reflection that his country has been the first to prove to the world two truths, the most salutary to human society, that man can govern himself, and that religious freedom is the most effectual anodyne against religious dissension: the maxim of civil government being reversed in that of religion, where its true form is "divided we stand, united, we fall." He is happy in the restoration of the Jews, particularly, to their social rights, and hopes they will be seen taking their seats on the benches of science as preparatory to their doing the same at the board of government. He salutes Dr. De La Motta with sentiments of great respect." I came across this exchange of letters when I started this blog two years ago. I was researching previous usage of the phrase that became the title for this blog. It seemed a perfect title for the theme I was promoting - that our federal government functions better, with greater financial responsibility, more oversight, less corruption, produces better legislation and provides greater governance when the legislative and executive branches are not held by a single party. I could not have been more pleased when I learned that the earliest usage of the phrase was written by the hand of Thomas Jefferson. His short letter speaks to the intent and the core convictions of a key founder and architect of our country and constitution. Consider the pride and importance that Jefferson invests in the principle of religious freedom and diversity in this letter. He finds it "gratifying" that our country was the "first to prove to the world" the "two truths" that are the most beneficial to human society - "that man can govern himself", and absolute "religious freedom" is the only answer to "religious dissension". It bears repeating - Thomas Jefferson considered religious freedom one of "two truths, the most salutary to human society". "Among the features peculiar to the political system of the United States is the perfect equality of rights which it secures to every religious sect. And it is particularly pleasing to observe in the good citizenship of such as have been most distrusted and oppressed elsewhere, a happy illustration of the safety and success of this experiment of a just and benignant policy. Equal laws protecting equal rights, are found as they ought to be presumed, the best guarantee of loyalty, and love of country; as well as best calculated to cherish that mutual respect and good will among citizens of every religious denomination which are necessary to social harmony and most favorable to the advancement of truth." The "Jew Bill" adopted in 1826 did not directly amend or strike the offending clause from the Maryland constitution, where it still stands today. Rather, the bill circumvented it. The Maryland Assembly saw fit only to allow Jews who affirmed their belief in an afterlife to sit as members. Today, while the Maryland constitution still formally limits public office holding to Christians, the clause is never enforced and religious tests are never applied to lawyers or elected officials." Like slavery, state sponsored religious tests and intolerance were recognized as evil by the founders of our nation, but like slavery, only partially addressed in their time. And what of our time? Does the electorate still impose a religious test for public office? It speaks well for our time that Keith Ellison, the first Muslim congressman was elected in 2006 and serves today. But could a Muslim be elected president? The eagerness with which some have propagated and defended the fraudulent “Obama is a Muslim” e-mail points to how much religious intolerance remains. Could a Jew be elected President? Possibly. How about a Native American who practices the religious rituals and ceremonies of his ancestors? Could a professed atheist or agnostic get elected to major office anywhere regardless of secular qualifications? back to your roots - good timing- and interesting reading. - serving Lamb Printaniere for dinner as I go back to my roots with the 1950 B. crocker. Nice post. I thought a trip to the rathole was next though. Thanks. The rathole post (aka "It's still the war, stupid") is still in progress. Stay tuned. Sadly despite what may be written in our laws and whatever people may say, We the People still do impose a religious test when it comes to elections--the presidential election in particular. Just look at the hoops that Mitt Romney and Barack Obama have gone through over their religious ties, real or imagined. And the idea of a distinctly non-Christian or (gasp) atheist president any time in the near future is unthinkable. People simply won't have it.